Utilising Almac’s UK & US commercial facilities, a global speciality healthcare company benefited from Almac’s expertise in integrated commercial product transfer for two of its branded generic products in the US market, completing technology transfer, CBE-30 approvals and finished pack commercial supply within a 10 month timeframe. 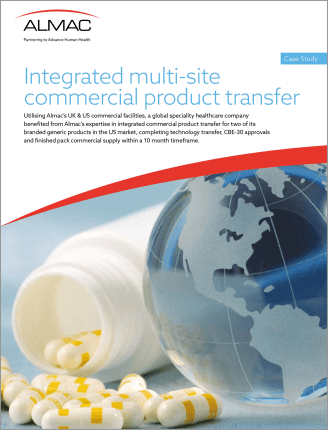 This case study illustrates how Almac overcame all logistical hurdles and technical hurdles including guaranteeing the API supply of a controlled substance from India and manufacturing two legacy products (tablets and capsules) with limited processing history, to provide an integrated commercial drug manufacture and packaging solution, to meet the needs of a key client. *By submitting your information you acknowledge that you have read the privacy statement and you consent to our processing the data in accordance with that privacy statement. We may, from time to time, send you material relevant to your interests. If you change your mind at any time about wishing to receive material from us, you can send an email to info@almacgroup.com. Every email we send you will also include an unsubscribe link so you can unsubscribe from our marketing list.